My people are revolting. Yes, they’re dirty and uncouth, but I mean they’re taking to the streets and rioting. And it’s all because of red bloody peppers. 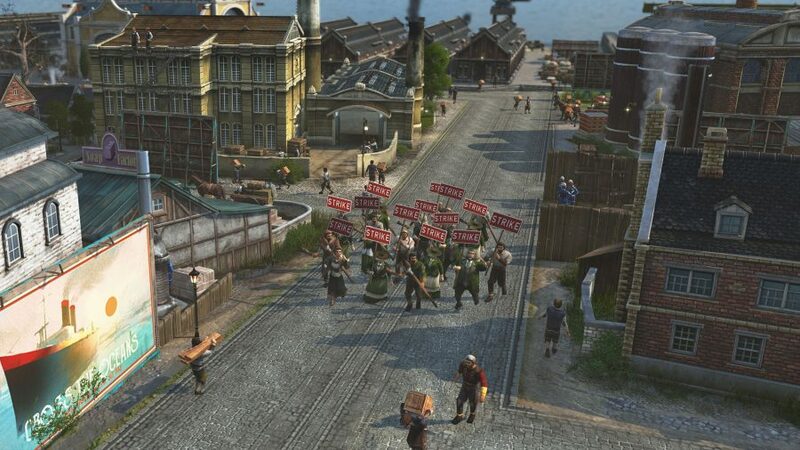 Anno 1800, like the other games in the series, is a city management game all about balancing the needs of your citizens. 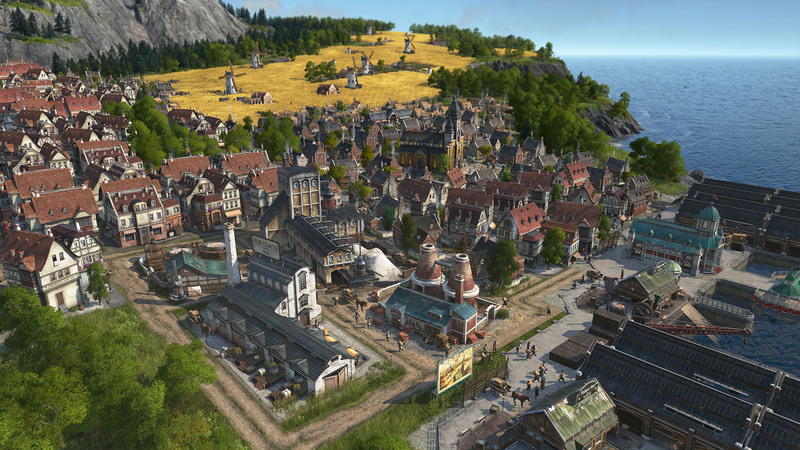 You start with an empty island, lay down some roads, erect houses and a marketplace, and watch as settlers begin to move in. Next you’ll put down a couple of simple businesses – foresters and lumberyards to make timber, a fishery to stop your populace from starving. Then, once food and shelter are sorted, the people will get more demanding. They want liquor, work overalls, and a pub. So you build a sheep farm, a mill, a potato farm, and a distillery. Of course, all those workhouses need staff so you have to build more housing too. Just when you get your citizens happy, they start getting ideas above their station. Upwardly mobile, see. The option to upgrade your farmer’s house to a worker’s house appears. Click it and the ten farmhands transform into ten workers. They bring the skills to construct new buildings with them, but also new needs that have to be satisfied – I truly admire that their essentials are sausages, soap, and beer. This transformation brings other problems, too. You’re down ten farmers, which may mean you don’t have the workforce to staff the industry you already have in place. So you must expand your city, building new homes. Somehow, every road leads to extra houses. I suppose this is how we got cul-de-sacs. It’s a fine balancing act. Particularly because of the way housing works. When you build a farmer’s house, it starts with just one resident and slowly fills to ten occupants from there. When you upgrade the building, all those farmhands become workers, but it also creates ten new slots in the home, allowing for a maximum of 20 occupants. If you start building tier two factories, which can demand 50 or more workers, you may rush to create that workforce by upgrading five farmers’ homes, but in time that will create 100 workers. All of whom, understandably, want jobs and the consumer goods of their class. Which brings me to the red peppers. My town is taking off, I’ve a population that is largely happy, and I’m producing piles of resources. In fact, my warehouses are filling up with bricks and lumber because I can’t find uses for them fast enough. I start exploring the region around me to see if I can offload the goods on some neighbours. I strike up a couple of trade deals, but the only thing they want is canned food. They’re interested in trade goods, sure, but not the simple stuff I have – only complex artisanal products. Losing track of my original goal, I set to work trying to flood the market with canned soup. First of all, I need to upgrade some of my worker’s houses to artisan level to unlock the technology that will eventually power students two centuries from now. Next I build cattle farms, a coal mine, a kitchen and canning plant, and – my nemesis – the red pepper farm. The whole supply chain demands hundreds of artisans, so I start upgrading worker’s houses all over town, buffing out the workforce. This creates a worker shortage, so I upgrade farmer’s houses to fill the gaps. And I then have to build rows and rows of new accommodation to replace the farmers I upgraded. Then, tragedy strikes. It turns out my island can’t support red peppers. Each strip of land has a set of fertilities allowing for the growth of different crops, and no one place will support every product. So I look around for the nearest unoccupied space that will put up with red peppers, send out ships loaded with iron and lumber, and build a small trading outpost. 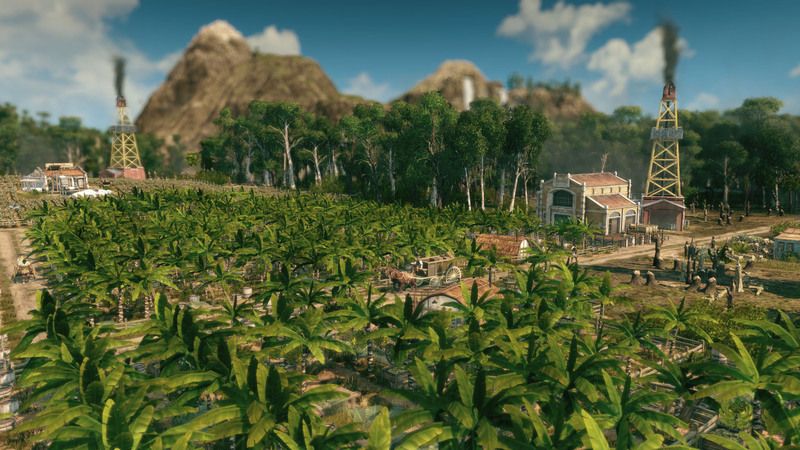 Each island has to have its own workforce and support itself, so I build – you guessed it – farmer’s houses, along with all the production buildings they need. I then upgrade houses to support workers and lay down pepper farms all over. If there is free space, it’s for growing peppers. One day I hope to codify that idea as the philosophy of my people. Back on my first island, meanwhile, my artisan workforce is getting unhappy. I upgraded those houses to create canned food for my neighbour but, of course, these new upper class citizens want fancy soup for themselves, too. Lah-di-dah. Unfortunately, it’s a product that I just can’t give them yet. I try to satisfy some of their other needs, setting up a sewing machine factory, but that only requires more artisanal workers, which means upgrading more worker houses and causes another shortage of staff. Now, though, because there are so many people living in my town, there’s a shortage of basic goods. There aren’t enough overalls or schnapps for my farmers, my workers don’t have enough sausages or soap, and my artisans want their damned pepper and beef soup. When there aren’t enough goods for your people their houses don’t reach full occupancy, and when a house isn’t full you can’t upgrade it. So I can’t immediately upgrade farmers to workers and fill the gap in the workforce. And all those tightly packed streets have become a hazard. Homes keep catching fire and the schnapps factory explodes, taking the sheep farm next door with it. Somehow, this accident fails to yield the lamb chops that might pacify my people. Meanwhile, my pepper island just isn’t producing enough peppers to fill a boat to send back to the canning factory to satisfy my artisans. It’s a web of interdependent problems that feels impossible to unpick, even with the help of tin-openers. That was a history joke, tin-openers weren’t patented until 1855. As my people grow unhappy they start to assemble in the courtyards behind their houses, standing on soapboxes and delivering speeches that denounce my ability to provide overalls and canned food. As populist messages go, ‘There are no baked beans’ is pretty damning. The dissatisfaction grows, and the people spill out of the back yards to start marching. It’s at this point, having failed to trade a single can of food with my presumably baffled neighbours, with my people rioting in the streets and the whole city ready to burst into flame, that I decide to restart my campaign and aim to settle my next island with a more considered approach. I didn’t stick around to see what happened to my first mayor, but I think I know – and I’ve no desire to be hanged for a pepper shortage a second time.